Even if you just let them go for a couple of weeks, it doesn’t take any time for weeds to end up making your yard look like a hay field. When this happens, a regular lawn mower just isn’t going to cut it (pun intended). Before you can use a lawn mower, you need to tackle the mess with a good trimmer, such as the Husqvarna 128LD 17-inch Straight Shaft Detachable String Trimmer with a 28cc engine. This is quickly and easily going to take care of the tall grass and weeds, so you can sit back and enjoy your yard. Get it done fast - One of the things we like the most about this trimmer is that it has a 17” cutting width. This means that you can trim a large amount of space in a very short amount of time. It uses a .095 diameter trimmer line, and it is gas powered, so you don’t have to worry about dragging an extension cord around with you while you work. Power - Because this is a gas-powered trimmer, it has more power than a cordless model. It can easily cut through just about any thick and heavy weeds. Because it has a long, straight shaft, it is great when you need to get into places that shorter models just can’t reach. Having this straight shaft also makes it a lot easier to maneuver than other types of trimmers. Replacement parts - If you ever have a problem with this trimmer, you don’t have to toss it out and buy a new one. You can easily go to any reputable Husqvarna dealership to order replacement parts for your string trimmer. Most parts are readily available, and if they aren’t in stock, they can easily be ordered. ​Weight - While this is not an ultra-light machine, at 10.8 lbs., it is not so heavy that you are going to get tired out before you get half of your work finished. It may take a few days to get used to, but after that, you will like the extra control you get by having this added weight. You will also like the fact that it is extremely durable. Engine - The 28cc two-stroke engine has a lower fuel consumption than competing models, and the emissions levels are lower. The engine is also a lot quieter than others. This is a powerful trimmer that is going to get the job done without making a lot of noise and disturbing your neighbors. You also won’t need to wear earplugs while you are working. ​Starter - All Husqvarna trimmers have the SMART START feature, and this one is no exception. This lets you start the trimmer quickly and with ease. Even those who don’t have a lot of strength will have no problem starting and using this trimmer. It may be a bit heavier than other models, but it is definitely easier to use. Handle - One of the neatest features about this trimmer is the adjustable handle. This lets you adjust the height to make it comfortable to use, no matter what your height is. There is a soft grip on the handle, making it more comfortable to hold, so you can work for longer periods of time without becoming uncomfortable. Just like any product, there are both good and bad things that people are saying about this Husqvarna trimmer. But, we have come to the conclusion that the pros definitely outweigh the cons. Let’s take a look at the pros and cons of this trimmer. Performance - We love the fact that this gas-powered trimmer is powerful enough to cut through the really thick stuff with ease. The two-stroke engine is what gives it so much power, much more than a battery-operated model. ​Works quickly - Cut nearly a foot and a half across at a time with this trimmer, so you get the job done faster than ever. This is ideal if you need to cut a path. It will cut just the right amount of width for a perfect pathway. Price - Another thing we like about this trimmer is the price. At its price point, we think you would be hard pressed to find a better deal anywhere. You are getting the quality of a Husqvarna product, at a price you can afford. Power - Some users say that they don’t think this trimmer is powerful enough to handle weeds more than a foot or so tall. If you have a lot of tall weeds and brush to get rid of, this may not be the machine you need. Starter - It has been reported that some people have difficulties getting this trimmer up and running. 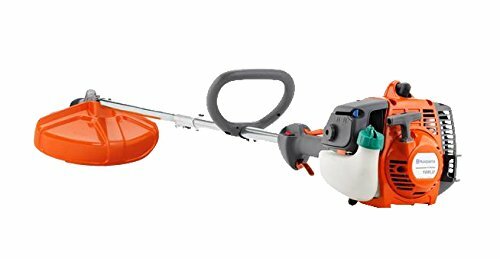 If you don’t like using an extension cord while you are working in the yard, a gas trimmer such as the Husqvarna 128LD is a great option. It is loaded with the power you need to cut through tall, thick weeds easily, and it cuts a wide path. The price is right, and this trimmer, like all Husqvarna products, comes with a great warranty if there are any manufacturer defects or other issues.